A broad general reconciliation on environmental and industrial affairs in Hvalfjörður has been completely ignored and stepped on by the Associated Icelandic Ports under the administration of a member of the social-democratic party Samfylkingin. This says Sigurbjörn Hjaltason, farmer in Hvalfjörður, who recently called for an investigation into the possible connection between bone deformities in his sheep’s skulls and an environmental accident at the Norðurál aluminium smelter in Grundartangi in 2006. Sigurbjörn has now raised awareness to yet another potential ecological disaster in Hvalfjörður – a fjord which already hosts two highly polluting factories: an aluminium smelter owned by Norðurál/Century Aluminium and an Elkem ferro silicon plant – as well as the abuse of power entailed in the process. Faxaflóahafnir [the Associated Icelandic Ports] requested that the industrial site at Grundartangi would be enlarged by 70,000 square-meters in order to place polluting industries there. The municipality, lead by the chairman of the parish council who is also a board member of Faxaflóahafnir, managed to put the change, which is now waiting a verdict from the Ministry of Interior, through by shady manners. Around 50 persons and parties made remarks on Faxaflóahafnir’s requested changes, but none of them were taken into consideration. But that wasn’t all: A detailed land-use plan was advertised beside the change of the general plan even before the deadline to make remarks on that particular change passed. As the authorities have kept silent it is still not certain what companies are involved in those plans. In July this year newspaper Fréttatíminn reported that a Finnish company called Kemira – involved e.g. in paper and fertiliser production as well as biotechnology – which plans to operate a sodium chlorate plant in Iceland for bleach production, is looking at two potential locations: Bakki by Húsavík on the one hand, also a planned location for an Alcoa aluminium smelter; Grundartangi on the other. Such a construction does not require an Environmental Impact Assessment (EIA) by default but needs to be notified to Iceland’s National Planning Agency, which then decides if an EIA is needed or not. The energy needed to run the plant, which is said to be 40 MW, would, according to Fréttatíminn, come from geothermal area Þeistareykir, given that the plant would eventually be built in Bakki. No particular energy source has been mentioned in the case of Grundartangi. Sigurbjörn and other residents of Hvalfjörður, who have filed repeated complaints against the plans to enlarge Grundartangi’s industrial site, have mostly been met with silence. While this should not necessary be surprising in a state that has still not ratified the Aarhus Convention, the Hvalfjörður residents were astonished to find out that the above-mentioned Hjálmar Sveinsson – who, in his article, Sigurbjörn says “can be remembered as a creative radio personality who one could contentedly listen to, especially due to his own stance on environmental and planning issues” – is one of the project’s key figure. 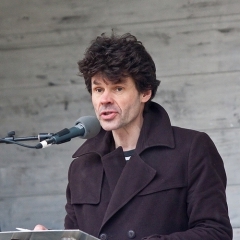 Sigurbjörn states that after weeks, months and years of Hjálmar’s radio talks on environmentalism and democracy, one would have considered it as likely that Sea Shepherd’s Paul Watson would become a whale-hunter in Hvalfjörður as that Hjálmar Sveinsson would advocate for polluting industries and abuse of power. Paul Watson visited Iceland in 1986, along with Rod Coronado, where the two of them famously sank two of the country’s whaling ships and sabotaged a whale-processing factory in Hvalfjörður. Neither Hjálmar nor any other authority figure responsible for these plans have openly responded to this criticism. Those aluminium factories and power plants will destroy wonderful Icelandic nature! The more factories they build, the more geothermal energy sources are needed, and construction of power plants includes the development of necessary communication routes, road connections etc. Iceland is a small and beautiful Arctic state and the industrial complex is covering more and more of its territory.